To be honest, I’ve been promising/threatening to move out of my townhouse for eight or nine years; but this is the year I intend to set my intention into motion. Perhaps it’s the tenth anniversary of my husband’s death or the fact that I’ve lived alone in the house we bought together for nearly as long as we shared the space. Maybe it’s the crack in the ceiling or the bumps in the wall; the peeling paint in the garage or the rising property taxes. Most likely it’s the fact that several of my closest friends have put their houses on the market and are dealing, painfully, with closings and contractors, agents and buyers, finishes and new beginnings. Whatever it is, I’m ready to go. I haven’t settled on the “where” quite yet, although I’ve narrowed it down. I fanaticize about a perfectly designed free-standing, one-story, one-person house, energy-efficient, well-appointed; unique in its design and its aspirations. I’m inclined to use an architect because I’ve worked with designers for much of my work life and because I want to create something special: not just a model home but a template for other singletons; neither too small nor too large but just right…assuming we singletons have made peace with living alone. To get ready, I’ve begun to tackle the “stuff”, all those objects one unthinkingly accumulates over years of staying in one place. I don’t hoard and I’m not above sweeping a drawer full of items into the trash from time to time. Still, I’ve lived in this house nineteen years, half that time with another person. In the finished basement I scarcely visit, there are boxes on shelves built by my former roommate, aka my late husband. Next to that box is another filled with lyric pages, vocal scores and charts from my years as a theater and pop composer, a memorable but highly unprofitable career I abandoned more than two decades ago. No one writes music by hand now; music software “listens” to what you’re playing and translates it fairly accurately into notes on staffs. I’m not even sure who reads music anymore. I look at the scribbles–the notes, the fading pencil marks, mixed in with a couple of photos taken with a Polaroid at a recording session. Who was that person? What did she expect would happen? There is a box of trinkets—there’s no other word for them—that I clearly valued at one time. They should be my madeleine, my gateway to a long-ago world but when I touch them, nothing happens—no sharply recalled moments visit me in the cold basement. The bulk of the photos are in albums stretching back more than forty years: My senior prom, my college roommates, my mutton-chopped boyfriend; images of our family, Mom and Dad looking predictably vibrant; programs, diplomas, yearbooks, newspaper clippings (Nixon resigns! )—they’re all here. The thirteen years’ covered by the images of my husband remind me how much time we spent together–and how little time I really had to become adept at navigating a lifetime relationship. There is a box of his with items from his early years. It’s logical that he would bring his cherished mementoes into the house and the life we were supposed to inhabit together for longer than his time with his parents. I sit among images and belongings of dead loved ones and missing friends, of younger selves with ambitious dreams and untainted hopes and I prepare to feel the predictable flood of emotions: a cocktail of grief and longing, sorrow and not a little rage at what was not achieved, not finished, not retained, lost forever, goddamn it. The wave never comes, only a little sigh escapes me, as if I were finally exhaling. This flotsam and jetsam is the tangible evidence that I’ve lived my life up to now. The memories are stored in the dusty closets of my mind; I can get to them as needed. I will one day need them. Old people go back as their future closes in on them. I’ve already had a glimpse of the hemmed-in existence that awaits me. But in this moment, I have to live, I want to live outside these boxes. I still want what’s new: new experiences, new places, new patterns; new connections. So I consolidate everything into one box; whatever doesn’t fit goes into a trash bag and out to the garage. It’s time to get moving. The prolific author Joyce Carol Oates has written a book about losing her husband, following in the heart-broken footsteps of many other such memoirs, such as The Year of Magical Thinking by Joan Didion. Oates’ book, A Widow’s Story, has been generally, although carefully, praised save for one review by New York Times critic Janet Maslin, who (bravely or foolishly; take your pick) questions author’s sincerity of purpose. It’s difficult for me to distance myself from these kinds of memoirs—as a writer or as a widow. My first reaction is almost always a distressing cocktail of anger, despair, envy, and confusion. The writer in me asks: How did there come to be a subset of memoir about spousal loss? How do we rate and rank these books? How do we rate or rank the loss? Are those with greater command of the language or the market share the ones who are most “qualified” to write about this subject? Does it depend on circumstance, or on context? Was my experience with grief and mourning worthy of a share of that “lucrative loss-of spouse market,” even though I was told way back in 2001 that the story of a middle-aged childless widow was far less compelling than that of a young mother of three whose husband had (also) died in the 9/11 attacks? The widow in me wonders: How long? The Oates book and Maslin’s review have generated a fair amount of blogosphere discussion about the grieving process. Author Ruth Conigsberg insisted that “…these memoirs are…highly subjective snapshots that don’t teach us much about how we typically grieve, nor more importantly, for how long.” Conigsberg, it should be noted, has her own book concerning the myth of the stages of grief. She notes optimistically that many older people do recover from losing a spouse to natural causes fairly quickly and even remarry, as did Oates. Her findings are not to be confused with studies that show younger people who lose their spouses in traumatic situations and remain widows or widowers are six times more likely to experience dementia. Nine and a half years after my traumatic loss, I float in a sea of doubt. I don’t even know if I’m still grieving or if something else is at play. Was my marriage at forty an anomaly, a one-time event? The more time that passes, the more I circle back to “before”—before I met the man I would marry; the years spent in the company of inappropriate, uninterested, non-committal men while yearning for the comfort of a stable relationship. I spent, will have spent, will spend, more years alone than in a romantic partnership. The marriage, as joyful, as sustained, as relieved and as (foolish me) safe as it made me feel, was a blip on the radar screen of my life, an accident of fate. I float, I coast and I wonder how I can draw any kind of illustrative, instructive or illuminating lessons from the before, the “during”, or the after. The writer in me thinks: Oates is a well-known, well-respected writer and professor at Princeton University. She’s out there. It might have been more, what, helpful, to let us know her process included finding happiness again so quickly. Then again, she wasn’t necessarily writing a self-help book, just an accounting. The widow in me understands: Any memoir I write would be so unresolved as to be thoroughly unsatisfactory, even to me. 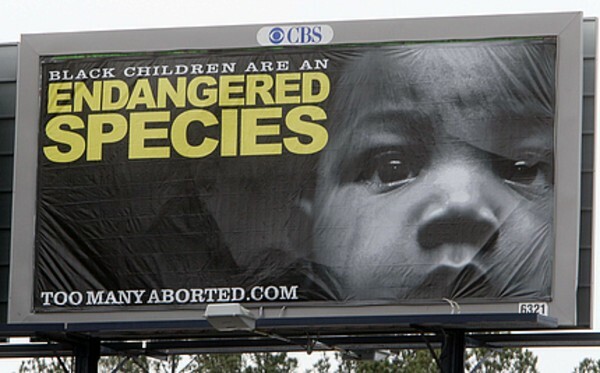 A series of billboards in Georgia are linking abortion with supposed “efforts” by various groups to reduce or limit the size of the black population. The ads first surfaced at the beginning of February, in time for Black History Month and have gradually been reported in the mainstream press. The most recent story appeared on March 1st in the Los Angeles Times. The billboards are the brainchild of Ryan Bomberger, founder of Georgia-based group “Radiance.” Bomberger, who is adopted, claims to be the son of a white woman raped by a black man. He believes data that shows a much higher percentage of black women seeking abortions, as well as the number of Planned Parenthood offices in urban areas, is “evidence” of racial targeting, a claim several minority women’s groups denounce as offensive, condescending, and dangerous nonsense. They concede the high number of abortions among black women in Georgia, but point to other socio-economic factors, such as limited access to birth control and family planning information as well as inadequate insurance coverage. But the anti-choice forces are jumping on the bandwagon. The Georgia Right to Life organization has partnered with Radiance on the eighty or so ads, which will be displayed at least through March. Alveda King, the niece of Martin Luther King, Jr., experienced a religious conversion after two abortions and now sits on the board of Georgia’s Right to Life organization. She claims to know absolutely that abortionists are targeting the black community for ethnic cleansing. As a staunchly pro-choice supporter, I am nevertheless deeply sympathetic to those who are deeply distressed by abortion. In truth, all of us are; as one advocate put it: “Pro-choice doesn’t mean pro-abortion.” No one I have ever met, including those who’ve had abortions, has ever been the least bit cavalier about the procedure, which is why I hope that a measure of common ground can someday be found — say, in efforts to expand information about birth control and family planning. But I’m also deeply offended by deliberately provocative and highly misleading advertising that attempts to shame and terrorize women who need and deserve support in making decisions about their reproductive health. Moreover, I’m infuriated by yet another attempt to use words to drive people further apart on one issue – abortion – by raising a red flag about another – racism. I’m afraid – truly afraid – we haven’t seen the end of these billboards. Although other holidays may seem to be specifically targeted (Mothers’ Day, Chinese New Year, Kwanza), Valentine’s Day comes across as the most exclusive. 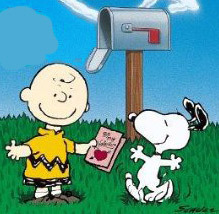 The day really is all about romance, which is why a V- Day shutout carries with it a particular sting, especially if you’re a single female (or Charlie Brown). No cards, no flowers, no candy or jewelry? Oh, the pain, the embarrassment, the loneliness! That a holiday named for a martyred 5th century saint managed to couple with an ancient Roman practice of allowing young men to choose young women by lottery as sexual partners is more than a touch ironic. That it has become a means by which those who are neither wooer or woo-y might feel slighted is nothing short of cruel. There are ways of dealing with V-Day. You could ignore it, of course, but where’s the fun in that? No, you have to get it to pay attention to you, accept you. Imagine how empowering that might feel, sort of like the Salahis felt after last November’s State dinner. DO buy a card. Or make one, if you don’t wish to contribute to the relentless marketing machine. Put it on your mantle. Believe me, you are someone’s valentine, even if said individual (or pet) is too inattentive or lazy to remember you (or lacks opposable thumbs). DO treat yourself to something: haircut, flowers, night out. Skip the chocolate; you’ll only hate yourself in the morning. DON’T go through old pictures, especially if they are of your old boyfriend or ex-husband. What are you, a masochist? DON’T hang out with anyone who freights V-Day with too much importance. It’s just a marketing holiday. DO something for your heart. Take an aerobics class, eat an egg-white omelette, walk the dog. And go ahead and have a piece or two of candy. They say chocolate is good for the heart, eh?